Throughout her childhood Maliyah Mason spent majority of her time dressing up in her handmade princess dress, and high heels, with a tiara on her head. Although she enjoyed chasing the idea of being a princess, she never pictured herself as a pageant contestant. 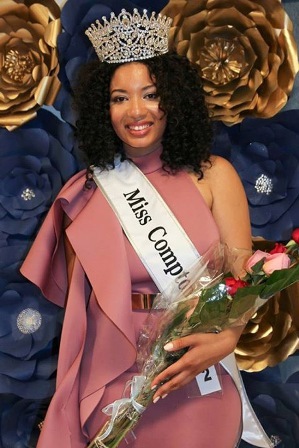 However, on Saturday, August 5, her childhood vision came to light when she was announced the winner of the 2017 Miss Compton Pageant. Since winning the title, the 20-year-old Compton native is focusing on accomplishing her pageant platform goals by teaching the children in city to appreciate and read classical music. “One thing I would really love to do is to take the kids to the ‘Los Angeles Philharmonic’ down at the ‘Disney Concert Hall’ let them sit in an orchestra seat and listen to something that I love and something I am passionate about,” said Mason. She goes on to discuss the importance of instilling a skill-like music appreciation in children prior to them going off to high schools and universities that are located in other communities and breaking down racial barriers. For Mason, wearing a crown on her head means much more than fashion and outward appearances. Mason values education and sees that as major part of her platform. She herself is bilingual and bi-literate. She encourages young women to try being a princess every day of their lives. “Get used to going in-front of a crowd of people, to stand up tall, and where a crown on your head so that when it does fall onto you, it’s not so much of a different weight,” she said. The young scholar is currently finishing up her senior year at Cal State Long Beach, where she studies film with a concentration in screen writing. Mason also holds an internship at ‘The HUB Radio’ in Compton. She is expected to graduate in 2018. Her future career goals involve owning her own production studio and creating a space where people of color can write stories about other people of color. She also wants to hire people of color as actors and as part of her production team. “My career goal is to shake as many hands as I can, to meet as many people as I can, and to learn the trade so that I can take it back and bring more people up with me so that we can show our side of the story to the rest of the world,” she said.